Here's another snapshot of life that I never really experienced, if I did, it was brief like a passing moment. 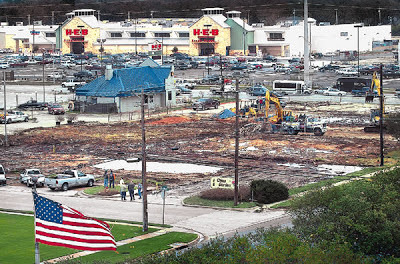 The loss of a large Texaco and a Chinese restaurant for a Walgreens. As it turns out, Walgreens does have a penchant for tearing down good Chinese buffets. The "Aggieland Texaco" was here, as listed as 2907 Texas Avenue on older (pre-2005) restaurant report cards, and based on nearby addresses (and there IS no longer a 2907 Texas Avenue), this is what it was, though it did convert to a Shell later. It replaced something else between 1995 and 2000, though I don't know what. The photo on the top is from the Eagle. I seem to recall a different photo from a different angle that had the gas station (fully intact) but I can't find it anywhere. Bummer. I know the gas station had brown brick, though. I don't have a lot of information on the businesses here, but Soundwaves was an audio store and China Garden had two levels, though the Chinese buffet had closed prior to being demolished. According to MyBCS, the rumor was the woman who owned it committed suicide, but I don't put a lot of stock in that (being a rumor and all). It was previously a Mr. Gatti's pizza. There was also a furniture store (in the back part? Or maybe the front? Never mind, see the comments) that was torn down. I can't tell which is Soundwaves and which is the furniture store, but Soundwaves was a head shop back in the 1970s. 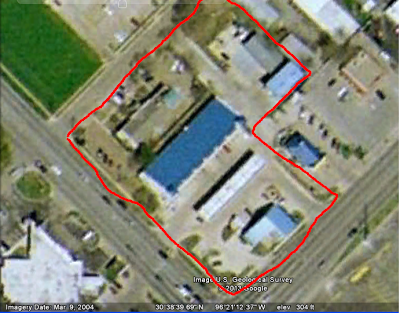 I was relieved that when they tore it down, they didn't touch the Golden Chick (blue roof) right next to it, but unfortunately it closed anyway about that time and turned into a Chinese fast food place. I never ate there when I went to Blinn, but if someone prefers one of the iffy Chinese buffets we have nowadays, well, that raises a red flag. Despite my feelings on the whole demolition thing...I admit that Walgreens is more useful than a gas station (even though it would've been nice to have a gas station on that side of the road), and it wouldn't be fair if I didn't mention that I utilized the small retail shops they built. I've returned Amazon packages at the UPS store (2005 charter tenant? ), I've bought pizza at Little Caesar's (fall 2010 opening), and I've used Walgreens (though there still is a vacancy between Little Caesar's and UPS). On the subject of Golden Chick--well...at least there's one in Hearne. EDIT 7/4/13: Mr. Gatti's closed sometime prior to Gattiland's opening. Mr. Gatti's in Northgate was the one that moved.